Even when streaking downhill, the power advantage of the turbo cars is obvious. 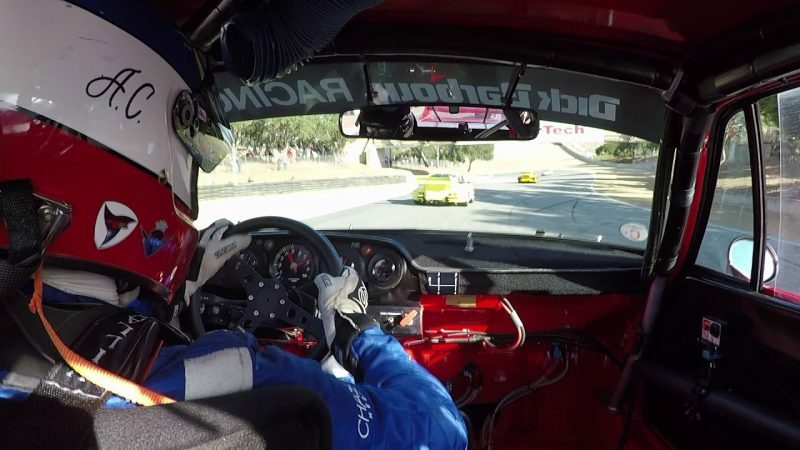 This isn't the first time Adam Carolla's taken his ex-Newman 935 around Laguna Seca. Now a familiar face at the big-name vintage events there, he shows some genuine bravery when threading this $4.8M racing icon through traffic at this year's Rennsport. Though it's a bit like hanging a Picasso above the stove, competing in the 935 is what it was meant to do—and the thick-skinned former host of The Man Show and Loveline proves his mettle by hustling this machine around a field of drivers of varying talent. The field's one throughline: all the cars seen here cost a pretty penny. Therefore, even if the lap here is a bit on the casual side, he deserves a tip of the hat; putting a car that pricey in a compromising situation takes some courage. What is obvious is the power advantage he and the driver of the yellow 935 enjoy. Screaming past a field of focused RSRs and 944 GTRs, the force-fed six is a real asset—especially at the power-favoring Laguna Seca circuit. With 589 horsepower and 437 lb-ft of torque powering a car weighing a mere ~2,200 pounds, it accelerates like an ICBM. There are likely very few former construction workers who now fire a classic racing car around one of the most prestigious racing tracks in the world as a hobby. Watching this footage certainly gives me some motivation to wake up a little earlier in the morning.